Can you believe it was only back in February 2013 when Netflix started streaming its own original content with House of Cards (in the news lately for all the wrong reasons thanks to the sexual assault claims against Kevin Spacey), now almost five years later it's hard to keep up with all the streaming platform's original television, movie and documentary offerings. Netflix became the first high-profile streaming service to land an Oscar nod for 2013's The Square documentary and earlier this year won its first Academy Award for the documentary short, The White Helmets, but it has yet to garner any feature film Oscar nominations. 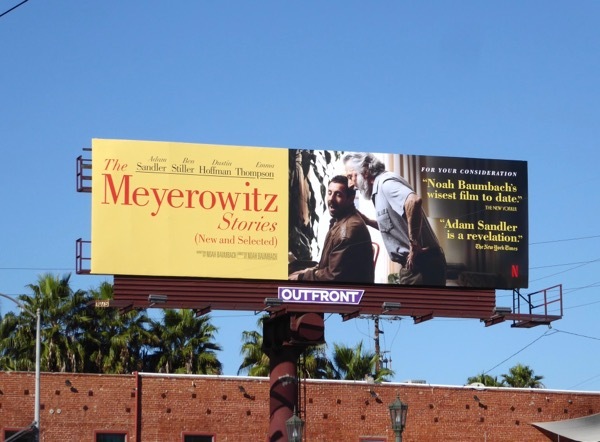 In the past it campaigned heavily for Beasts of No Nation starring Idris Elba, but maybe this year Noah Baumbach's dysfunctional family drama starring Ben Stiller, Adam Sandler, Dustin Hoffman (currently dealing with his own sexual harassment claims) and Emma Thompson, The Meyerowitz Stories (New and Selected), will help Netflix garner some nominations. 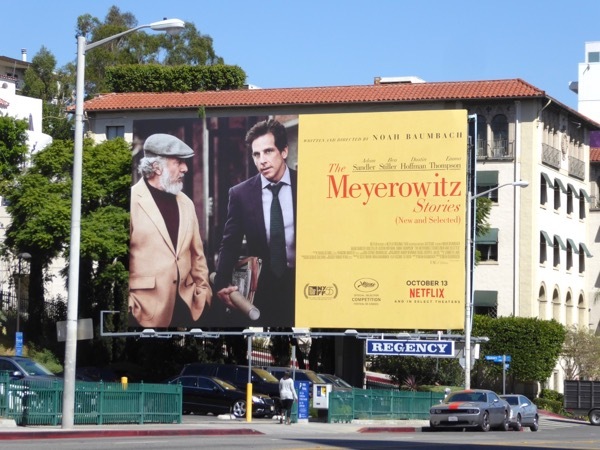 The launch billboards for the movie featured above were photographed along the Sunset Strip and Beverly Boulevard from October 4 to October 22, 2017. 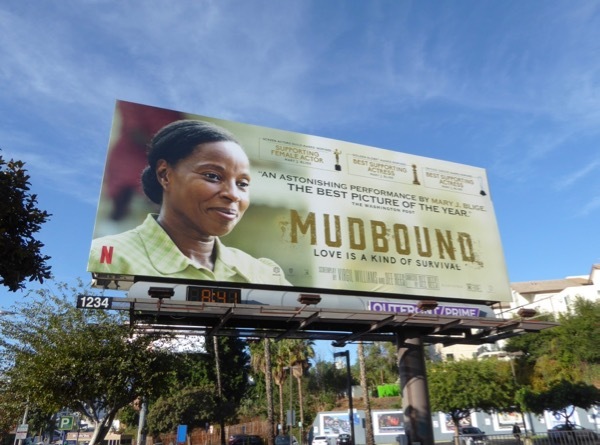 Meanwhile the awards campaigning billboards for the Netflix original film were spotted from November 17 to December 1, 2017 along Santa Monica Boulevard, Bundy Drive and Robertson Boulevard. It's certainly awards season in the city skyline and lots of other accolades to be gained too, like Golden Globes, SAG Awards and Critics' Choice Awards to name but a few. 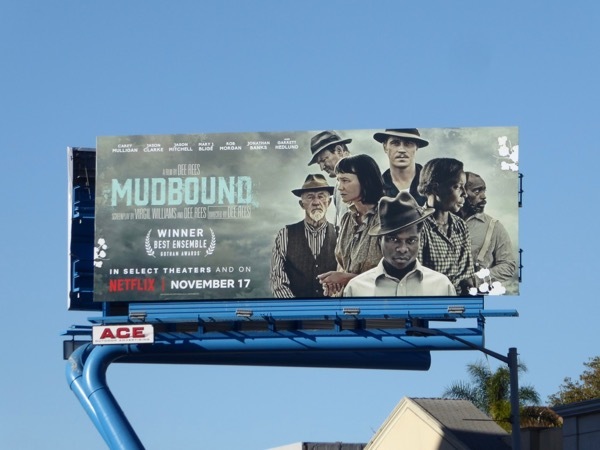 If The Meyerowitz Stories doesn't excite voters, then maybe director Dee Rees new Netflix picture Mudbound will be the hit of the winter awards season. 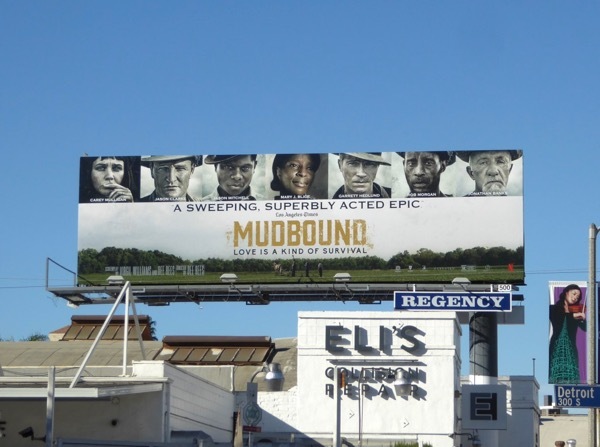 The feature film stars Mary J. Blige, Carey Mulligan, Garrett Hedlund, Jason Mitchell, Jonathan Banks, Rob Morgan and Jason Clarke and follows the story of two men who return home after fighting in World War II to work on a farm in rural Mississippi, where they have to readjust to life and racism after the war. 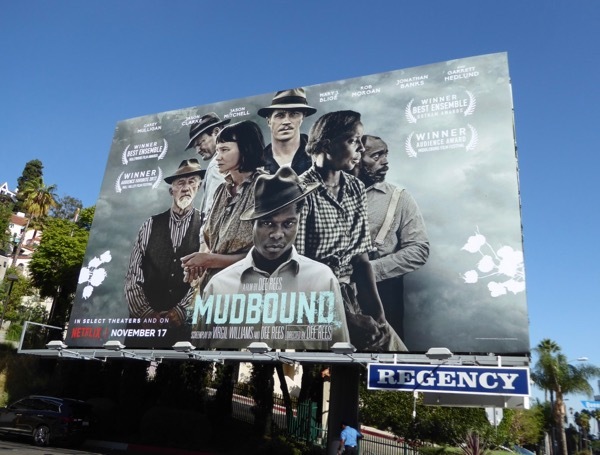 These launch billboards for Mudbound were spotted along the Sunset Strip and Melrose Avenue from November 6 to November 18, 2017. 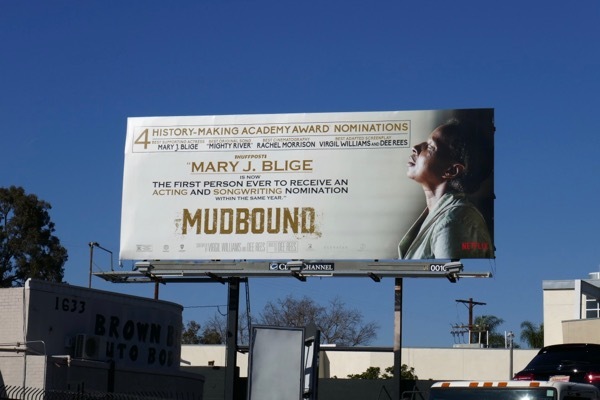 Meanwhile this 'For your consideration' billboard for rapper-turned-actress Mary J. Blige was spotted along Melrose Avenue on December 6, 2017. 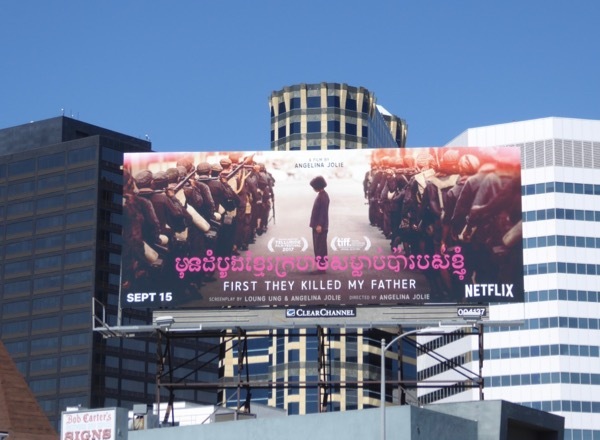 Another Netflix film hoping for some recognition this season is First They Killed My Father: A Daughter of Cambodia Remembers. Directed by Angelina Jolie, this potential nominee for foreign language film recounts the horror endured by Cambodian author and human rights activist Loung Ung as a child under the rule of the deadly Khmer Rouge in the 1970s. 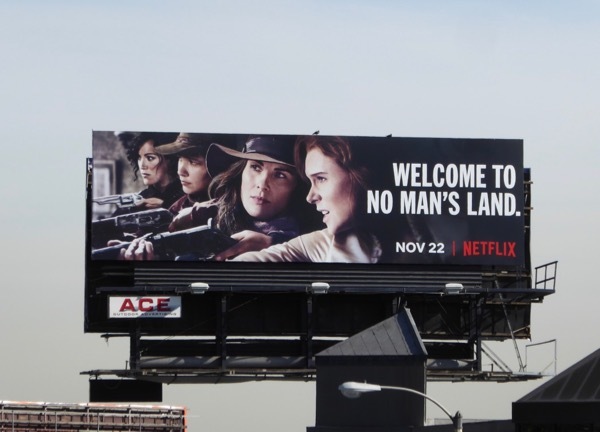 The launch billboard was snapped above Westwood Boulevard on September 24, whilst the Netflix FYC billboard for the biographical film was spotted along Melrose Avenue on November 18, 2017. 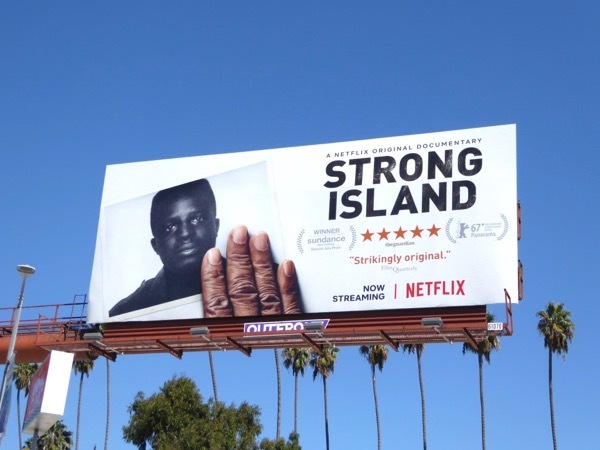 Netflix has become a real platform for documentary makers and last year Ava DuVernay's 13th documentary film was nominated for an Oscar, so can Yance Ford score any nods this season for Strong Island, which examines the violent death of his brother, William, and the judicial system that allowed his killer to walk free. 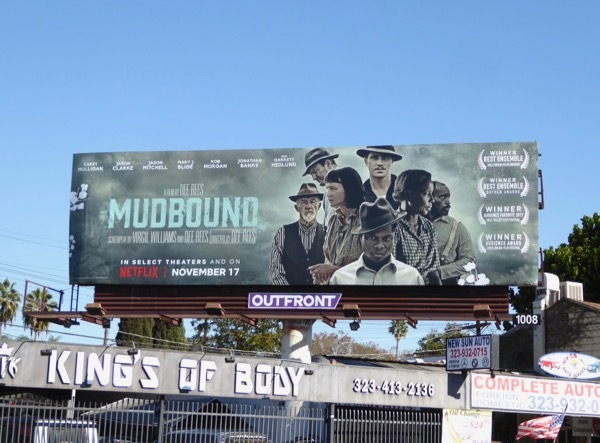 The documentary launch billboard was snapped above Santa Monica Boulevard in West L.A. on September 24, whilst the FYC version was spied above 3rd Street on December 1, 2017. 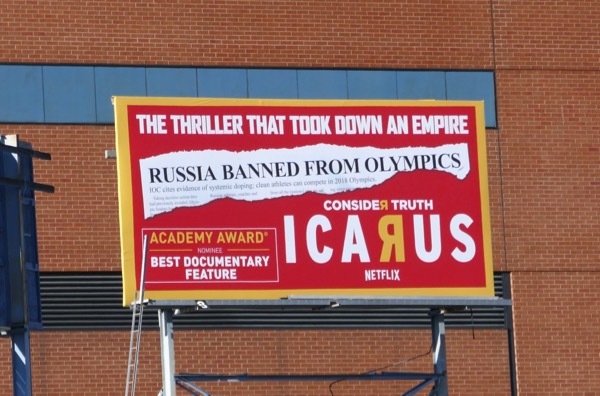 Meanwhile with the recent news of Russia being banned from the PyeongChang 2018 Winter Olympics in Korea, the documentary from first-time filmmaker Bryan Fogel, Icarus, about the Russian doping scandal at the Sochi 2014 Winter Olympics is even more topical. 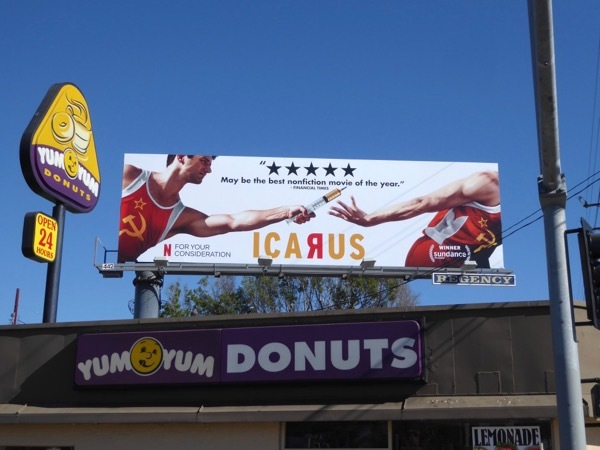 Will this FYC billboard snapped above the intersection of Vine Street and Melrose Avenue on November 18, 2017, help Icarus run away with a few awards this season? 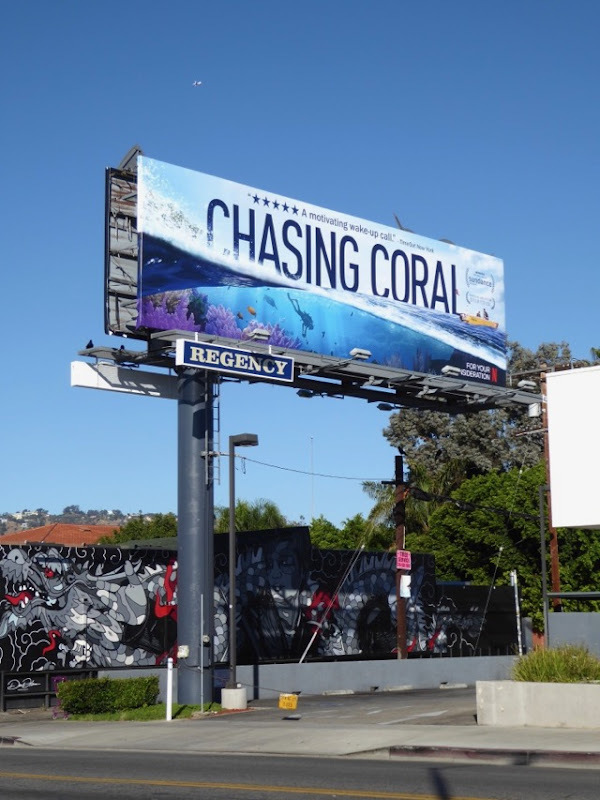 And finally for this installment of Netflix awards consideration ads, this Chasing Coral documentary FYC billboard was spotted at Melrose and La Brea Avenues on November 18, 2017. 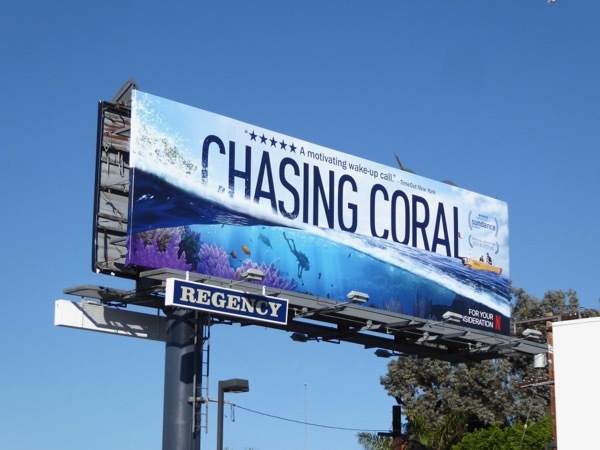 Anyone who cares about the world's environment and the vanishing coral reefs will find this documentary by director Jeff Orlowski compelling, but will the various academy voters think the same? 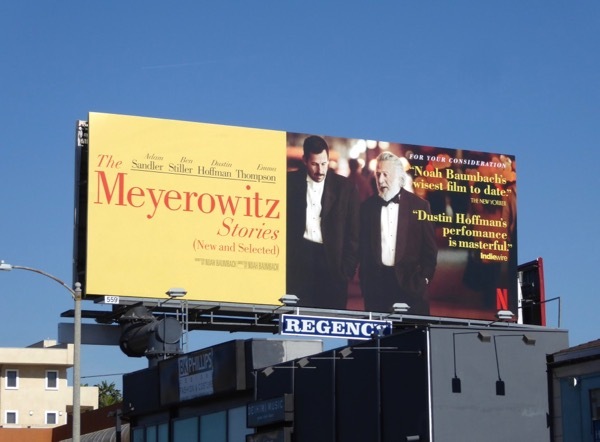 Daily Billboard is sure that these are not the only Netflix awards campaign billboards we'll see around L.A. this winter, but it's a good start. 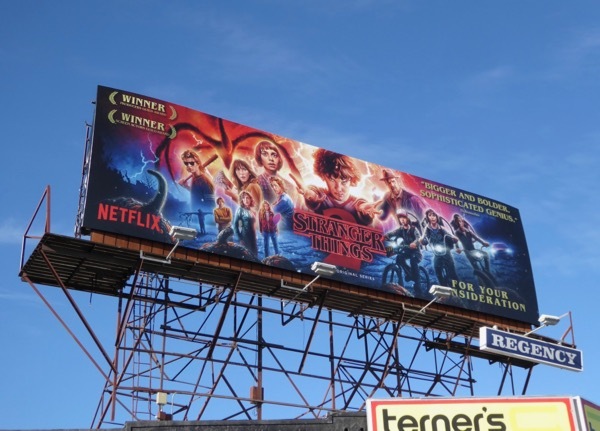 UPDATED: Following the announcement of two Golden Globe nominations for Stranger Things, for Best Drama Series and Best Supporting Actor for David Harbour, here's a FYC billboard for the second season snapped along the Sunset Strip on December 11, 2017. 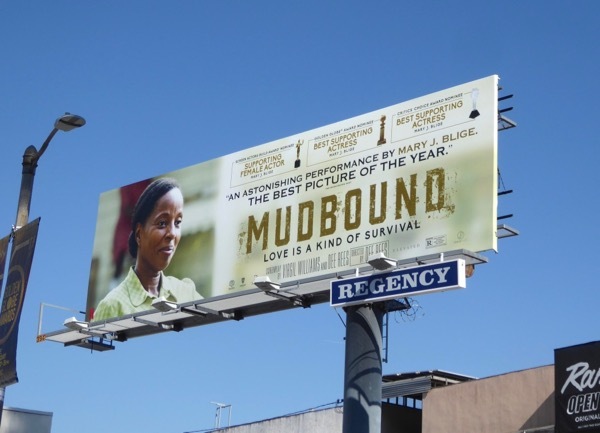 UPDATED: Here's also a new awards consideration billboard for the motion picture Mudbound, snapped along L.A.'s 3rd Street on December 12, 2017, following its two Golden Globe nominations for Mary J. Blige for Best Supporting Actress and for Best Original Song, 'Mighty River', by Raphael Saadiq and Mary J. Blige. 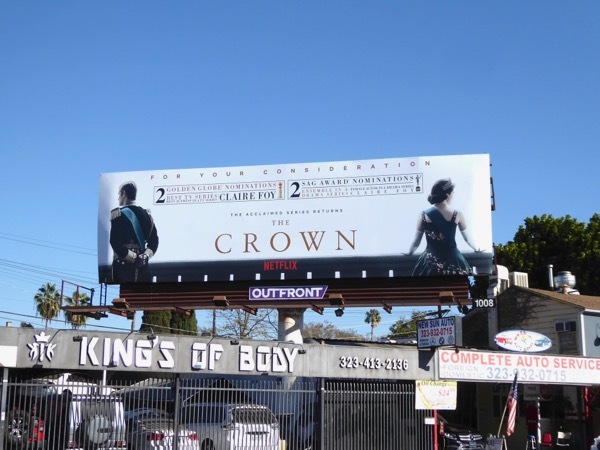 UPDATED: Here's also a nomination billboard for The Crown's second season, which has garnered two Golden Globe and two SAG Award nods, spotted along Melrose Avenue on December 27, 2017. 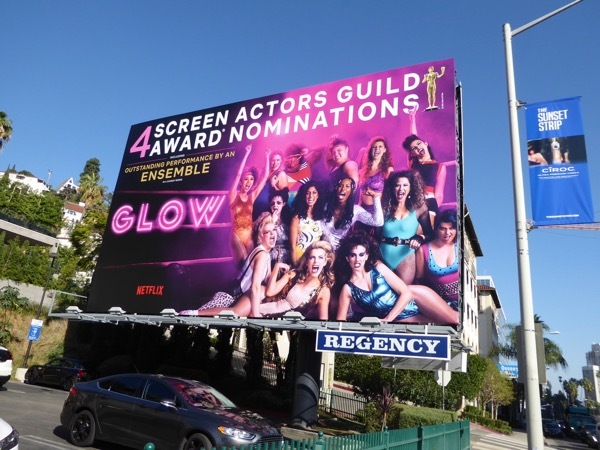 UPDATED: Congratulations to the first season of GLOW for garnering four SAG Award nominations and one Golden Globe nod for Alison Brie in the 80s lady wrestling comedy. 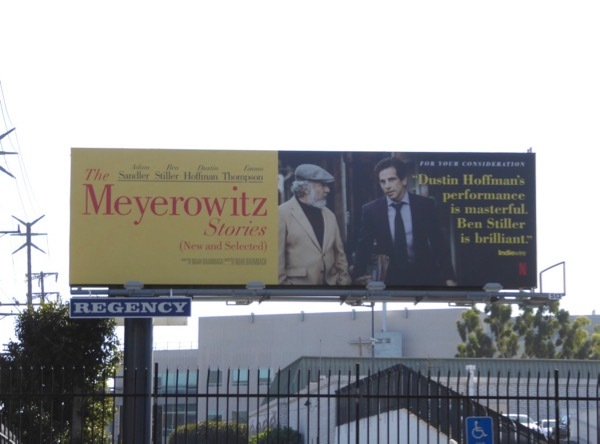 This awards nomination billboard was first spied along Melrose Avenue on January 3, 2018. 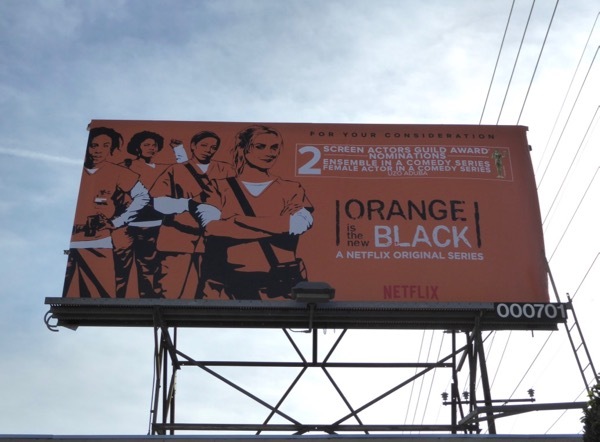 Plus here's also a SAG Award nomination billboard for the ladies of Litchfield Penitentiary and Uzo Aduba for the dramedy's fifth season, spotted along La Cinema Boulevard on January 5, 2018. 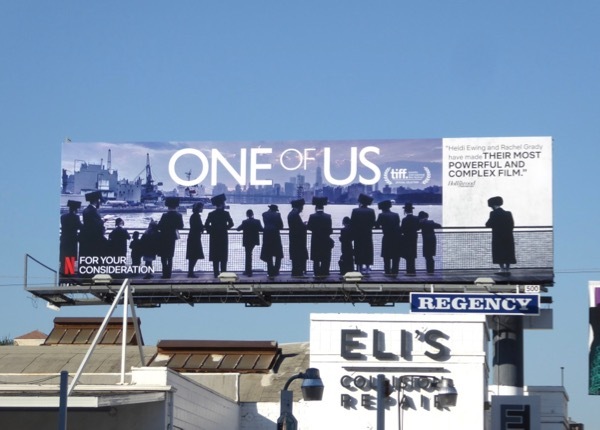 In addition here's another consideration billboard for the Netflix documentary about New York's Hasidic Judaism community, by filmmakers Heidi Ewing and Rachel Grady. 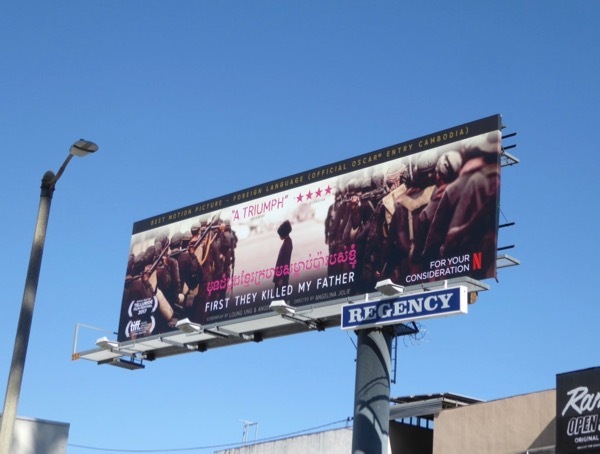 The FYC billboard was spotted along L.A.'s 3rd Street on January 3, 2018, whilst the billboard for the documentary's initial streaming release date was photographed along Santa Monica Boulevard in West L.A. on October 21, 2017. 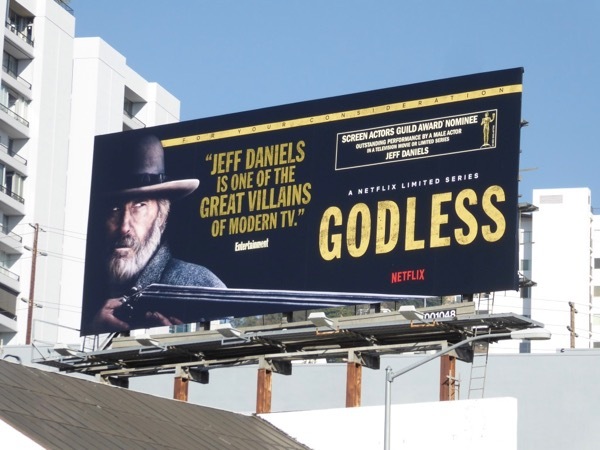 Another Netflix offering garnering a Screen Actors Guild Award nomination this season is Jeff Daniels for his villainous role in the limited series, Godless. 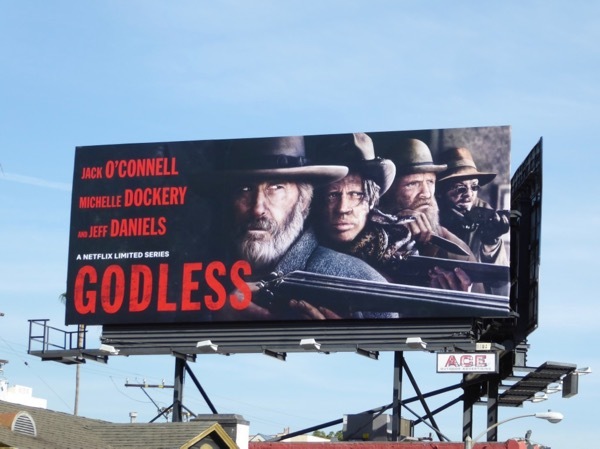 This awards consideration billboard for the Western mini-series was spied above West Hollywood's Santa Monica Boulevard on January 3, 2018, whilst the duo of promotional launch billboards were photographed along the Sunset Strip on opposite sides of the road on November 28, 2017. 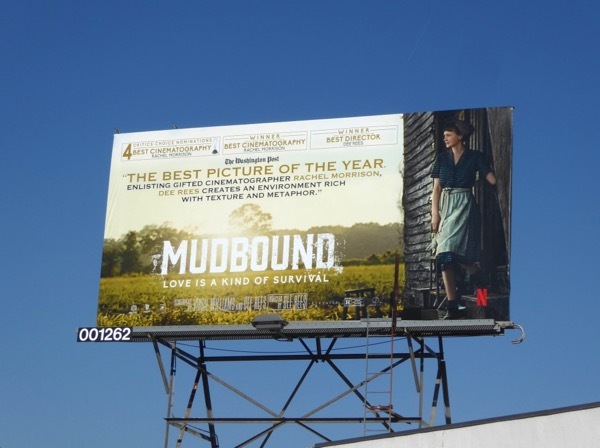 Plus here's also another Mudbound awards consideration billboard featuring Carey Mulligan spotted along San Vicente Boulevard on January 5, 2018. 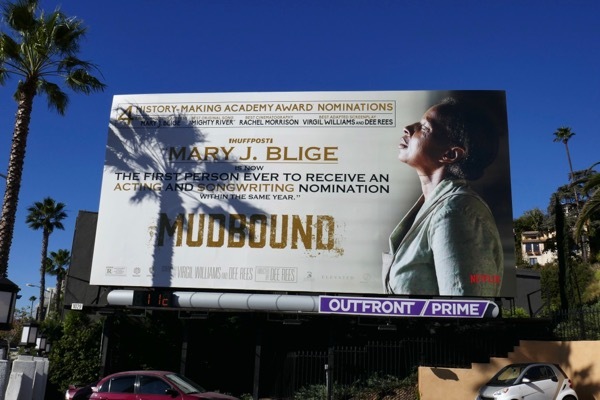 And she may not have won the Golden Globe for Best Supporting Actress but here's another awards nominee billboard for Mary J. Blige for her role as 'Florence Jackson', snapped along the Sunset Strip on January 10, 2017. 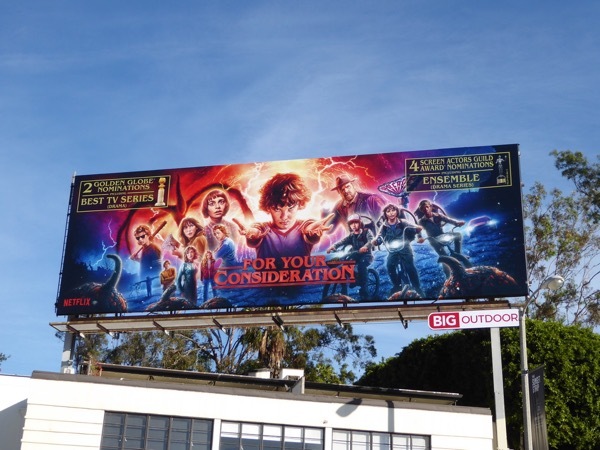 Plus further west along Sunset Boulevard this Stranger Things 2 'For your consideration' billboard was also spotted the same day. 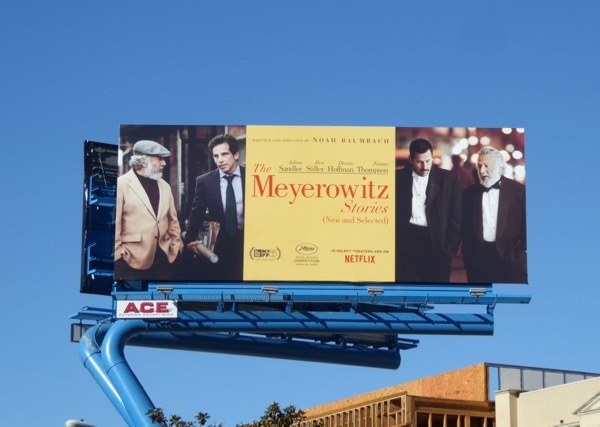 UPDATED: Alison Brie may not have won a Golden Globe this year after being nominated, but this extra SAG Awards nominee billboard for the ensemble cast is a pretty cool consolation prize and was photographed on January 10, 2018. 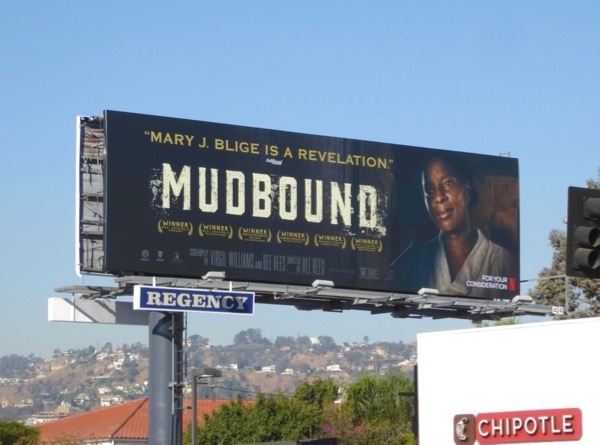 Here's also another Mudbound nominee billboard for Mary J. Blige spotted along Melrose Avenue on January 11, 2018. 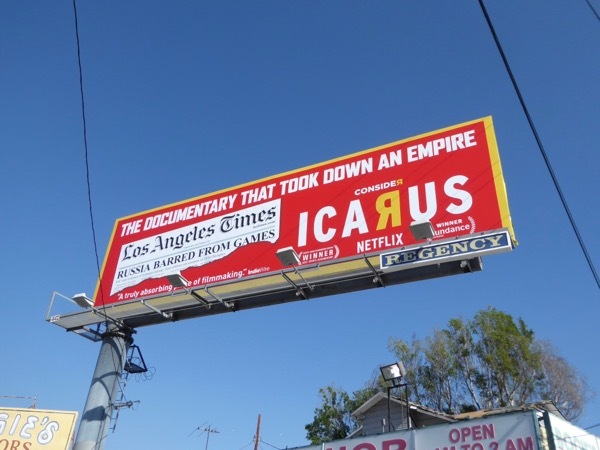 Plus a new consideration billboard for Netflix's Icarus documentary also spotted along melrose Avenue the same day near Paramount Studios and all those potential voters. 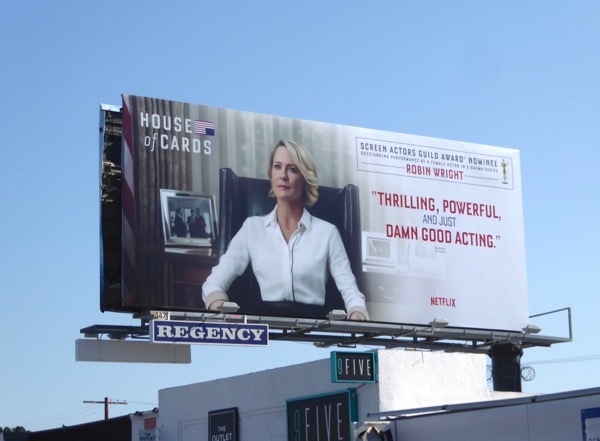 And congratulations to Robin Wright for her SAG Award nomination for the fifth season of House of Cards supported by this billboard further west along Melrose Avenue, let's hope her amazing performance and chances aren't tarnished by the scandalous actions of Kevin Spacey. 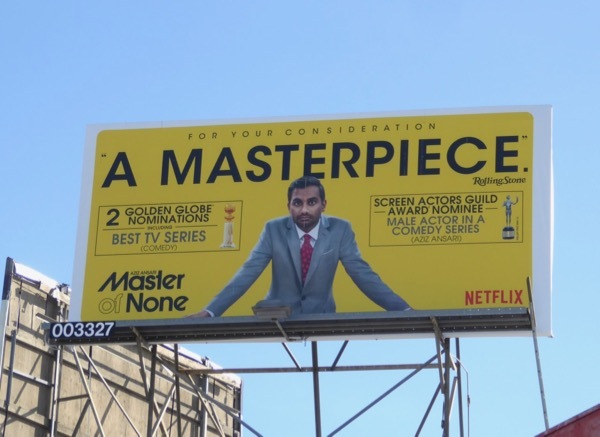 UPDATED: Here's also an awards consideration billboard for the sophomore season of Master of None spotted along Santa Monica Boulevard in West L.A. on January 15, 2018, although probably not the best timing with the sexual misconduct allegations against him. 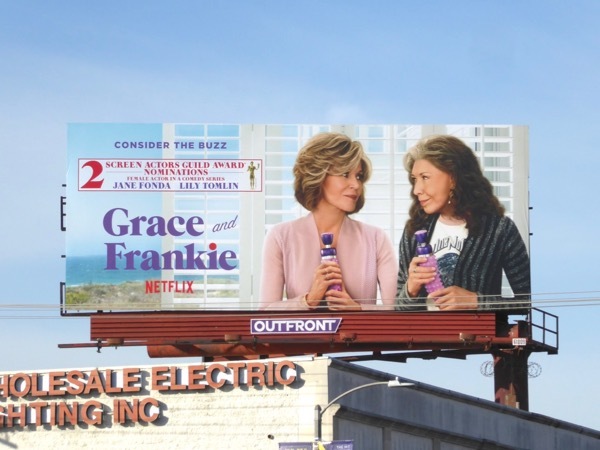 Plus on a lighter note, here's a Screen Actors Guild Award nominations billboard for the stars of Grace and Frankie, Jane Fonda and Lily Tomlin, and their third season, snapped above Beverly Boulevard the same day. 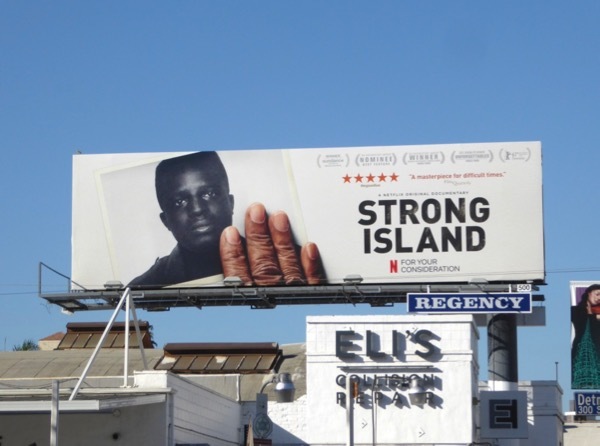 UPDATED: Congratulations to Icarus for securing an Oscar nomination for Best Documentary Feature (along with Strong Island) and this billboard was spotted along San Vicente Boulevard on February 7, 2018. 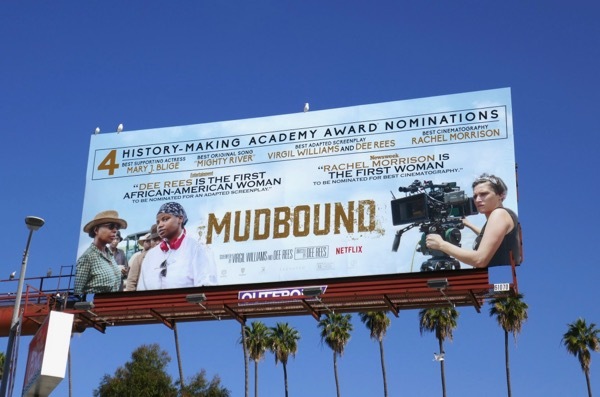 And here's also an Oscar nominee billboard for Mudbound, which garnered four nominations, including making history with Rachel Morrison's nod for Best Cinematography, the first woman to be nominated in this category. 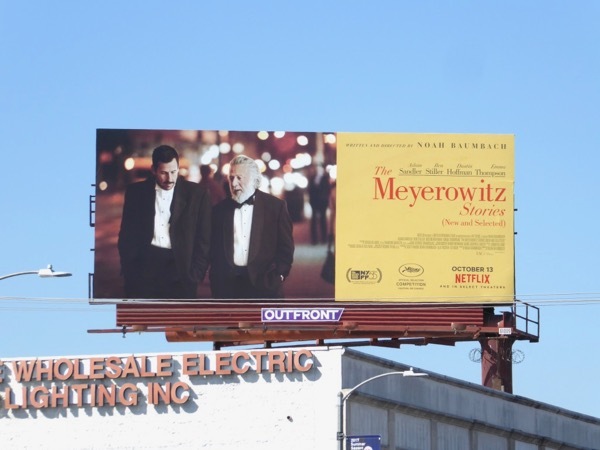 This Academy Award nominee billboard was snapped along Santa Monica Boulevard in West L.A. on February 11, 2018. 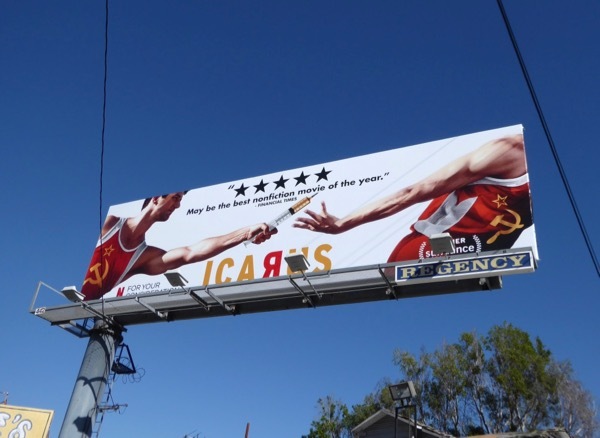 UPDATED: As the 90th Academy Awards draw ever closer more and more awards campaigning billboard appear in L.A.'s sprawling skies. 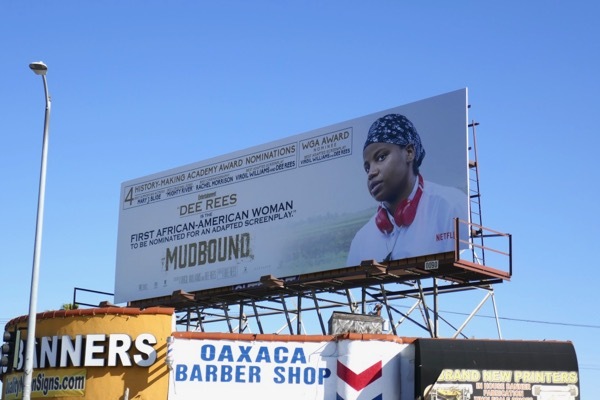 Here are more Oscar nominee billboards for Mudbound and the film's director Dee Rees for Best Adapted Screenplay, the first African-American woman to be nominated in this category, plus billboards for Mary J. Blige, the first person to receive both acting and songwriting nominations. 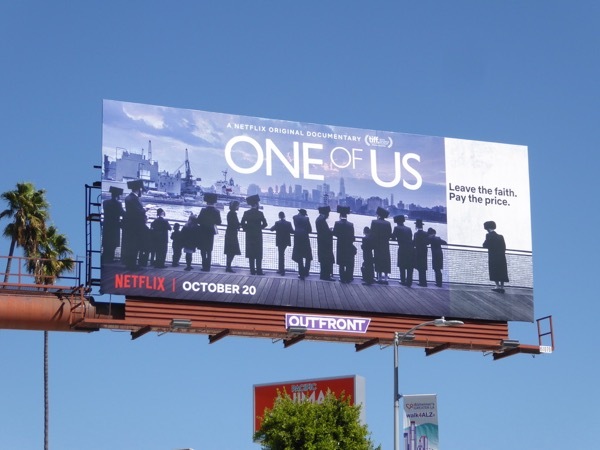 These Netflix consideration billboards were snapped along the Sunset Strip, La Cienega Boulevard and Robertson Boulevard from February 19 to February 20, 2018.